This article appeared in the March 14, 2018, issue of AL DÍA. At times, it still doesn’t feel real. At times, it’s hard to believe, in a nation built by immigrants, that nearly 63 million Americans voted for Donald Trump in the 2016 presidential race, electing a man who ran a campaign saturated with anti-immigrant rhetoric and propaganda. At times, it’s hard to believe the racism, the hatred, that spews from the president’s mouth, from calling Mexicans criminals and rapists during his campaign announcement, to attempting to ban Muslims from entering the U.S., to referring to Haiti and African nations as “shithole countries” just two months ago. At times, it’s hard to believe that many Americans continue to defend and justify this man’s actions, that Trump maintains a great deal of support throughout this country. But he does, and this reality cannot be ignored. 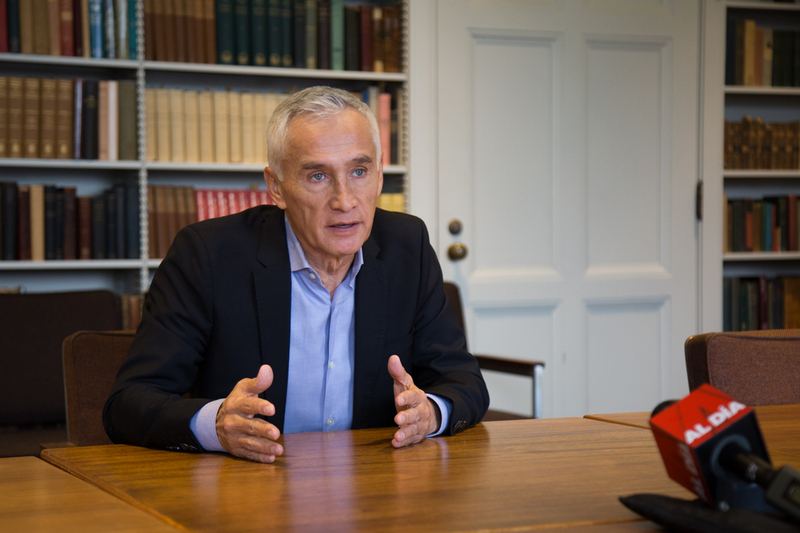 It’s something that acclaimed Mexican-American journalist and longtime Univision anchor Jorge Ramos has understood since Trump first made his foray into politics. Those unfamiliar with Spanish language media may remember Ramos from an exchange the reporter had with then-candidate Trump in Dubuque, Iowa, in August 2015, that made headlines. During a press conference, Ramos interrupted Trump to question him about his intention to deport 11 million undocumented immigrants and build a 1,900-mile wall along the U.S./Mexico border. Ramos was eventually let back into the press conference, but Trump's initial reaction spoke volumes. This incident, and the emotions that came with it, forms the foundation of Ramos’ latest and thirteenth book, “Stranger: The Challenge of a Latino Immigrant in the Trump Era.” In the memoir, which was released Feb. 27, Ramos details the famous exchange to initiate a discussion on immigration, using facts and figures to dispel negative right-wing myths that immigrants breed crime and contribute little to this country. He also relays to readers his own immigrant story. Born and raised in Mexico City, Ramos moved to the U.S. in 1983 to escape the censorship in his home country that hindered his work as a reporter. With only about $2,000 to his name, he drove to California with a student visa to attend a one-year course at UCLA Extension. Now, he’s an Emmy Award-winning journalist and perhaps the most recognizable face in Spanish language media in the U.S.
As the title of the book suggests, the anti-immigrant sentiments that have pervaded American discourse, championed by people like Trump, members of his administration and his supporters, often leave Ramos feeling like an outsider in this nation where he is a citizen. A nation where he has spent more than half of his life and raised two children. A nation he considers home. 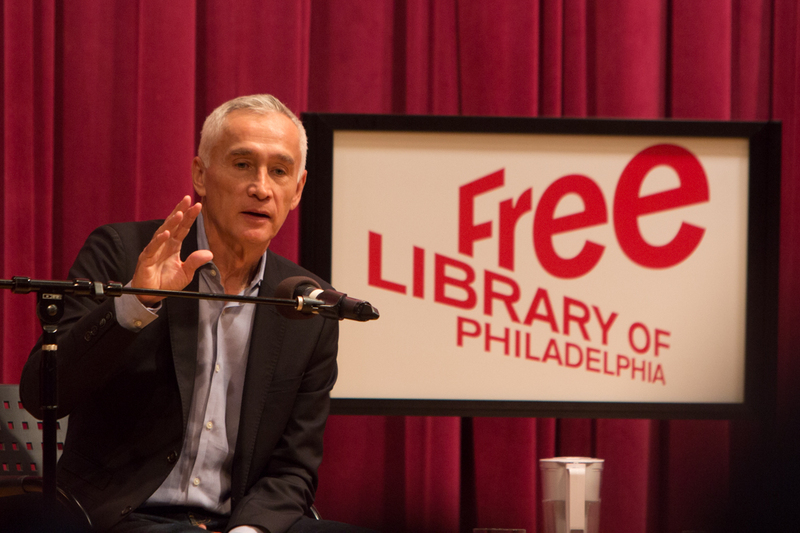 On March 2, the Free Library of Philadelphia hosted Ramos for a discussion about his new book, which was attended by about 200 people. 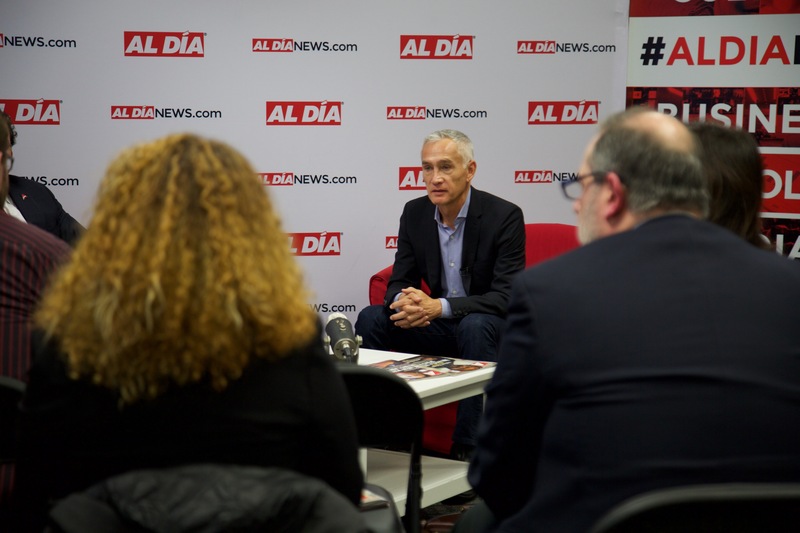 Immediately after, Ramos visited the AL DÍA office for a conversation with AL DÍA CEO Hernán Guaracao. This article includes moments from both of these events. Ramos recalled, during his exchange with the future president, how Trump told him, “Go back to Univision,” though Ramos believes these words hid a deeper meaning. For Ramos, the fact that one of Trump’s supporters followed him out of the press conference, emboldened enough to demand Ramos leave “his” country, proves one thing. “Hate is contagious,” Ramos said. Elaborating on this condition afflicting the U.S., Ramos said the nation is in the midst of a demographic revolution — by 2044, all ethnicities in this country will be a minority. This desire, sought by an unfortunate number of Americans and reflected in President Trump, has left many immigrants like Ramos—Latino and otherwise—feeling painfully unwelcome. What’s worse is this anti-immigrant attitude is a complete rejection of American values. Like many commentators prior to the 2016 election, Ramos believed that Trump could not possibly win. Out of the 27 million Latinos who were eligible to vote in 2016, only 13 million cast their ballots on Election Day. For Ramos, one reason that less than half of eligible Latinos participated is that Democrats had broken a promise to introduce in Congress immigration reform to help undocumented immigrants during President Barack Obama’s eight years in office. Further, Ramos noted that about 2.5 million people were deported under Obama’s administration. “I think Barack Obama was an inspiration to many of us. I think he’s a historical figure, but when it comes to immigration, he just didn’t deliver,” Ramos said. “He failed, and that explains why many Latinos decided to stay home." What this does not explain is that reportedly 29 percent of the Latinos who participated in the election voted for Trump. This statistic reveals something about the nature of Latinos in the U.S.—their beliefs, their values, their identities—that is far too often overlooked. Regarding the future of Latinos in the U.S. political process, Ramos is certain of one thing: the need to elect more Latino leaders. While Latinos represent about 20 percent of the U.S. population, Ramos indicated that there are only 30 members of Congress of Latino descent. For Ramos, achieving adequate representation in government is a challenge that Latinos must overcome. With these words at the beginning of his book, Ramos dedicates “Stranger” to the Dreamers. The author said he now understands that his generation had been searching in the wrong way. They should not have been seeking out one or two Latino leaders, but thousands of them, and that’s exactly who the Dreamers are. Despite fear of deportation, the Dreamers have bravely made their voices in this country unignorable. Because of their advocacy, Obama enacted Deferred Action for Childhood Arrivals (DACA) in 2012, and now that Trump is working to kill the program, jeopardizing the lives of hundreds of thousands of people, the Dreamers have become sand in the gears of the president’s anti-immigrant agenda, fighting not only for their own rights but the rights of all immigrants. Ramos noted the Dreamers’ approach is so different from that of their parents—people who remained silent in the shadows, and rightly so, to protect the lives of their children. But these children have stepped into the spotlight, pushing for immigration reform much like the survivors of the mass shooting in Parkland, Florida, are pushing for gun law reform. To Ramos, the courage of all of these young people serves as an overwhelming inspiration. Ramos closes “Stranger” with a note to his two children, Nicolás and Paola, urging them to “disobey.” As the Dreamers have demonstrated, Ramos said resisting the injustices being enacted by the top rungs of the American government is everyone’s responsibility. “It is not only my advice, but that’s the only way to survive in this world nowadays,” he continued. 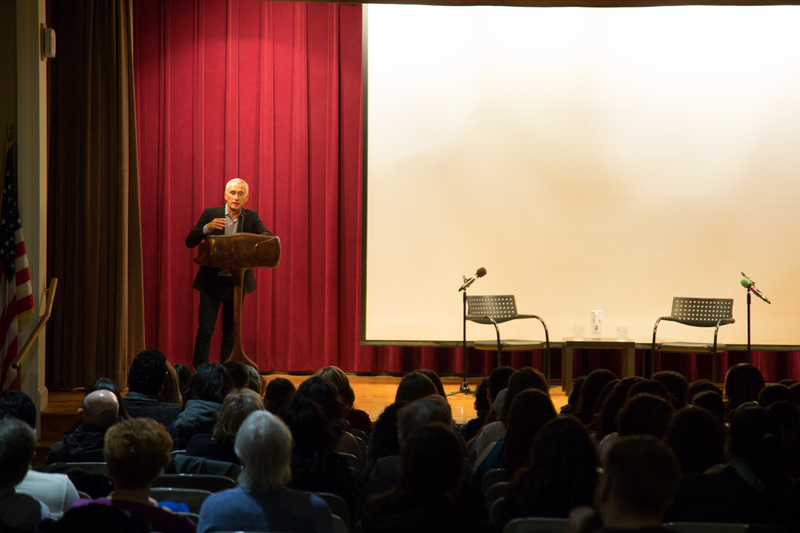 Ramos explained that journalists like himself must play a crucial role in disobeying when those in authority are abusing their power, such as President Trump. 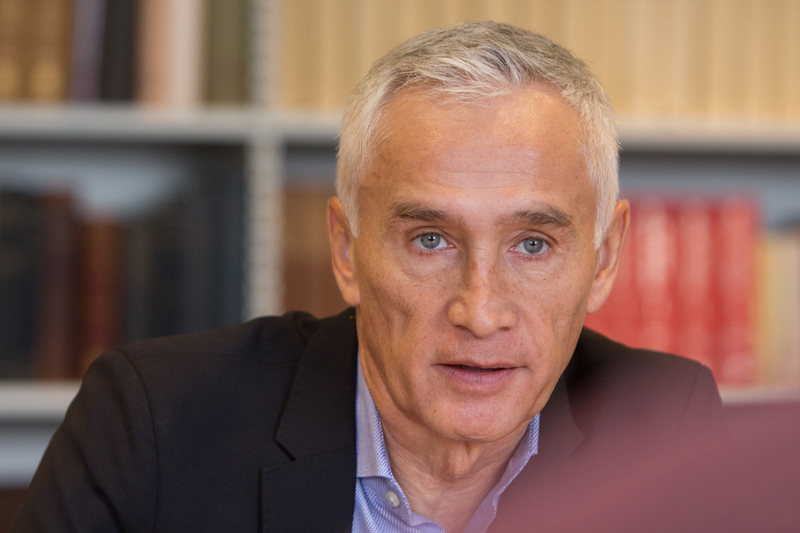 Ramos believes that the future of Spanish language media is safe (for now). According to Ramos, there will continue to be an audience for Spanish language news as long as immigrants from Latin America continue to enter the country in the numbers that they do. The longtime anchor said he’s confident that this will remain the case for the next 25 years or so, but it may be a different story in 50 to 75 years. As for the children of Latino immigrants, the majority of whom prefer their media in English over Spanish, Ramos said it’s important to find ways to connect with them, like Univision has done with its experimental offshoot network, Fusion. When Univision conceived the idea, Ramos recalled, the network wanted to attract a young Hispanic audience. “They told us, ‘If you want to reach us, reach us in a network that is open to everyone,’” Ramos said. So, instead of creating a network for young Latinos, Univision created Fusion as a network targeted toward millennials. “These young Latinos, they feel so part of the United States that they just didn’t want to be put in a different basket,” Ramos said. To aspiring journalists, Ramos advises them not to follow exactly in his footsteps. Ramos explained that there is “a migration of eyes from the big screens to the small screens,” indicating that the younger generations are now consuming news and other content less from television stations and more from digital outlets. 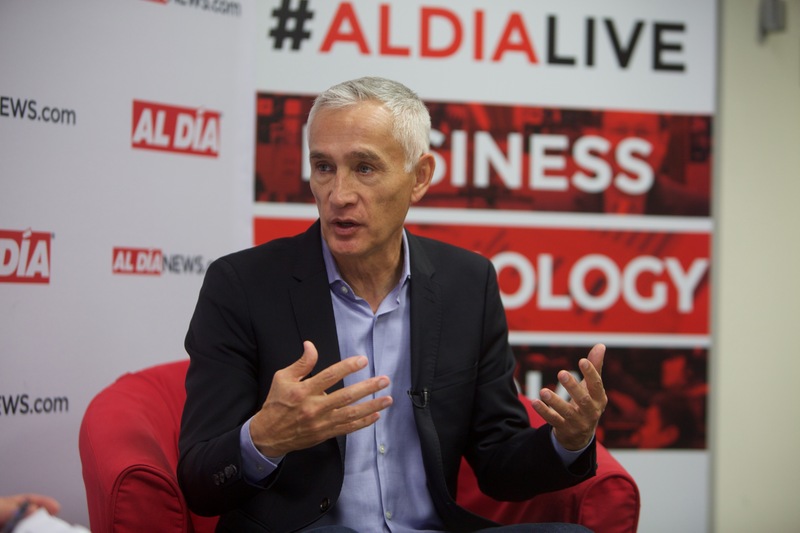 It’s a new reality that media networks need to accept, Ramos said, and the best modern journalists have already embraced social media and other digital platforms to deliver the news. Journalism is rapidly changing, and as a broadcast news anchor, Ramos knows he is asking viewers to participate in an outdated concept.